Trappola - thanoscardgamess jimdo page! Trappola in Italian means mouse trap, cheat, fraud. This is one of the earliest trick taking card games in literature. The earliest reference is since 1524 in Italy. It is a trick taking game for two players. 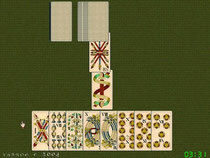 The game is played with a latin-suited 36-card deck containing the A, K, C, J, 10, 9, 8, 7, and 2 of each suit. The goal is to score points in four ways - by card combinations before play, winning point-cards in tricks, winning the last trick, and winning a trick with a 2. The point-cards are: Ace - 6 pts, King - 5 pts, Cavalier - 4 pts, Jack - 3 pts.Each player is dealt nine cards in batches of 4 and 5. The remaining 18 cards are set aside as a stock. If the non-dealer does not like their hand, they may discard their hand face up, and take the next nine cards from the stock. If they still dislike their hand, they may again discard and take the final 9 cards. If there are cards left in the stock, the dealer also has the option of discarding and drawing a new hand one or two times (depending on how many cards are left). You play it with the medieval Trappola cards.